After allowing the dough to rise for about 16 (nearly the ideal 18) hours, we took it out for some further handling. Putting the dough on a floured work surface, we folded it over itself a couple of times. Then, we covered it with some plastic wrap, and let it settle down for about 15 minutes. When the 15 minutes were up, we shaped the dough into a ball. Instead of coating our hands with flour, another blog suggested dipping hands in water, to keep the right ratio of flour to water, so we did that. After the dough was a nice ball shape, we placed a cotton towel in a bowl and liberally coated the towel with flour. Then, we plopped the dough ball down onto the pre-floured cotton towel, and let the dough rise for 2 hours, covering it with another towel. About one and a half hours later, we started pre-heating the oven at 450 degrees, and also placed the Dutch oven, with lid, in the oven as well. For future reference, the oven at 1605 runs on the hotter side, so next time we should use it at 425 degrees, give or take, instead. When the two hours were up, then we plopped the dough ball, sans towels of course, into the already hot Dutch oven. We gave the Dutch oven a few shakes, so the dough was more evenly distributed, and then put it back into the oven, lid on, for half an hour. After the 30 minutes were up, we removed the lid and placed it back into the oven for another 15 minutes. In our experience, the bread was already fully baked after 30 minutes and the extra 15 minutes, lid off, was probably to get some nice browning (a little too much in our case). 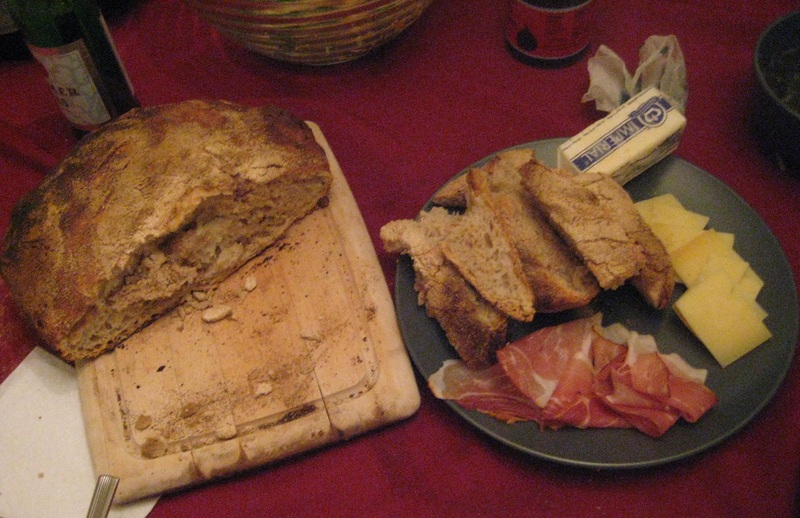 In the end, the bread looked and tasted great (albeit with some burnt parts on the bottom – perhaps due to the temperature of the oven and because the Dutch oven sat pretty close to the flames of the oven). The bread was soft and springy, and the outside had a nice crunch. All in all, a very successful venture. Oh, and don’t forget to dust off the excess flour (i.e., wiping with a clean towel), before cutting the bread. 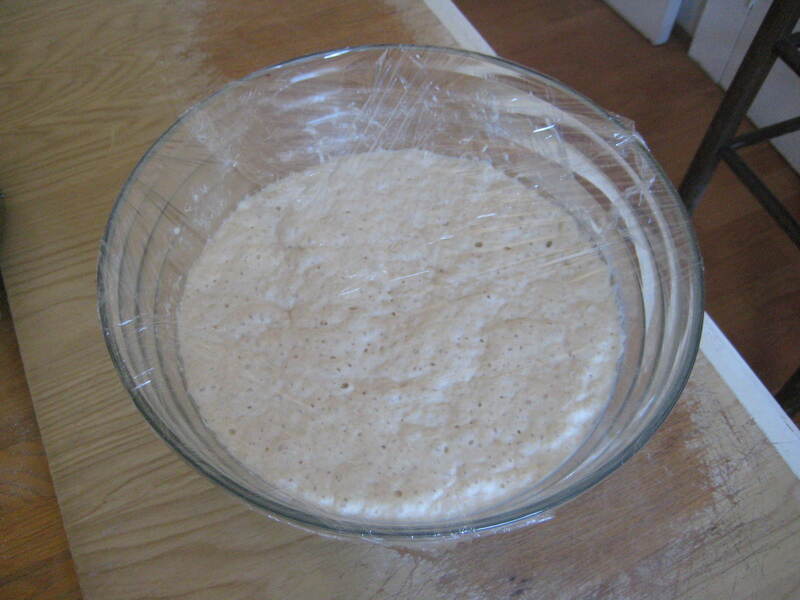 To recap: prepare dough, let it sit for 12-18 hours (18 is ideal); fold the dough a couple of times, and let it sit for another 15 minutes; mold the dough into a ball and let it sit for another 2 hours (and 1.5 hours in, pre-heat the oven to 450 degrees, along with the Dutch oven); bake the dough for 30 minutes, lid on; bake the dough for another 15 minutes, lid off; eat and be merry. 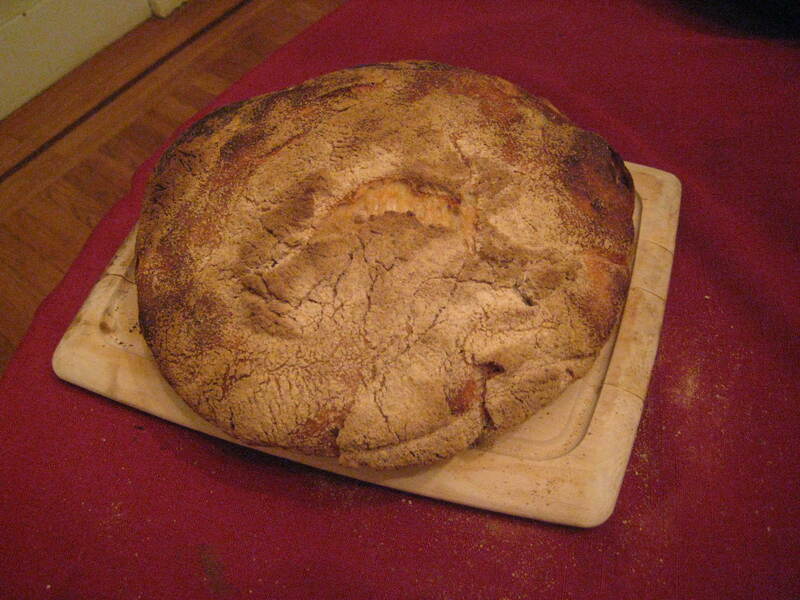 This entry was posted in Recipes, Side Dish and tagged Baking, Bread, Dutch Oven. Bookmark the permalink.